Determine your state's requirements for executing a will. Ask the clerk at the probate court or the law librarian to find the relevant probate statute describing will execution requirements in your state. Most states require two witnesses who affirm that that the testator signed the will and also that she knew the document was her will (termed "testamentary intent"). Some states require three witnesses. A notary cannot replace the witness requirement since a notarized signature does not affirm testamentary intent. Select two witnesses, or three if your state so requires. Your witnesses must be qualified to testify in court, so choose adults 18 years or older with at least average reasoning ability. Select witnesses younger than you are to make it more likely that you will predecease them. Most states require "impartial" witnesses, so do not select anyone who stands to inherit under your will. Some states preclude spouses from serving as witnesses. Affirm to the witnesses that you are about to sign your last will and testament. In their presence, initial each page of the will, then sign the will at the bottom. Below your signature is a witness statement. It declares that the testator acknowledged the document as her last will and signed the will in the presence of the witnesses. Ask each witness to sign on a witness line below the witness statement. Since the witnesses may be called to court to testify during the probate of your will, include their street addresses and telephone numbers below their names. Execute a holographic will without witnesses, if permitted in your state. A holographic will is written entirely in the testator's hand. In some states, holographic wills can be used only when the testator is faced with imminent death, but in other jurisdictions -- like California -- such wills can stand in for printed wills in all circumstances. 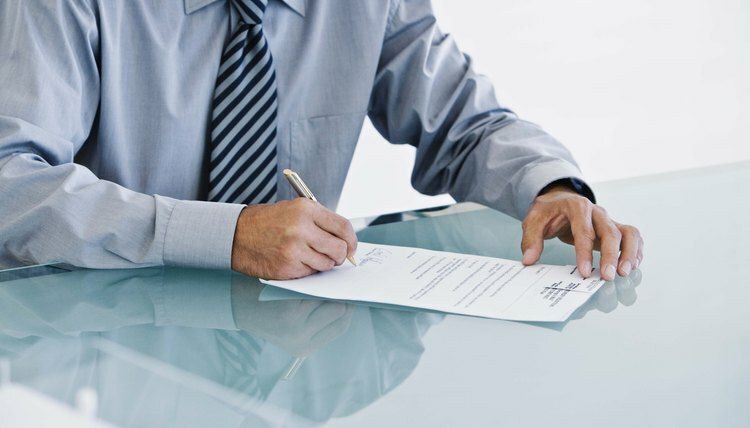 The testator signs the will and no witness signatures are required. Every state has its own set of unique laws that govern inheritance. These laws, known as "laws of intestate succession," provide guidelines as to the priority of heirs. In other words, these laws explain who is entitled to an inheritance -- and how much they're entitled to receive -- when a relative dies without a will or dies with an invalid will. How Can I Do My Own Will? Less than half of American adults have wills. One reason for this low figure might be the common perception that wills are complicated and expensive to prepare. Although large and complex estates may require estate-planning services and legal advice, many people with smaller holdings use simple testaments. All jurisdictions accept self-drafted testaments that meet probate requirements. Some states -- such as California -- make it easy for people to draft their own wills by providing a valid form will in the statutes and allowing handwritten wills. Do I Need an Attorney to Make a Legal Will? What Constitutes a Legal Will?